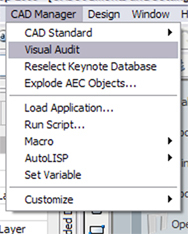 The command you are looking for is called Visual Audit (AecVisualAudit), and can be found on the CAD Manager pulldown. What you do not have the CAD Manager pulldown? For that you may need to turn this on by going to Window>>Pulldown>>CAD Manager Pulldown. Note: This command temporarily turns off the display of all AEC Objects as well as text (dtext, mtext), leaders and dimensions. Once started if you press ESC, ENTER or mouse-click you will end the command. For those with a wheel mouse you can zoom in/out and pan to view the non-aec entities on the screen. (HEWV) Architectural Firm's "Knowledge Cafe", located at 120 Atlantic Street, in Norfolk, Va. between Waterside and MacArthur Mall. 7:00-7:30pm - Topic #1 - Veredith Keller will demonstrate the Autodesk Viz 2005's Material Editor. One of the most useful Viz 2005 features is to build realistic materials. We'll develop a new material in this presentation. 7:45-8:30pm - Topic #2 - EVAUG Officer Nick Fuller will demonstrate forming and using schedules in Autodesk Building Systems. Schedules are very helpful for estimating costs, and engineering analysis. Nick uses schedules for listing ventilation ducts and diffusers. Also mark your calendars for the February 17, 2005 meeting which should be a lot of fun (check the calendar section of the website for more details). In the last post discussing the removal of material assignments from objects in your scene I received two e-mails asking how to remove the material assignments from the objects selected and not from everything in the scene. Like the last maxscript example we looked at this will leave the materials that are defined in the material editor but what makes this different is that it will remove the material assignment(s) only from the selected geometry in your scene. Had a great time in Portland, Oregon last week. As many of you know I am an avid reader and connoisseur of books. Before leaving for this trip I had coffee with Greg (who was there last month) and he recommended a great book store to visit called Powell's City Of Books. Greg mentioned it was large but not how large, try one city block x 4 stories. This was a dream and sadly I only had a few hours to spend at this location all while drinking a Peets coffee. For those looking to spend some time browsing with beautiful furniture stop reading the catalog and visit Design Within Reach. I have ordered a few things by mail over the years, but mostly spend the time browsing the catalog but this occupied the remaining amount of my time before heading home. I cannot wait to get back to the Portland area sometime soon. This will leave the materials that are defined in your material editor but remove the material assignment(s) for all the objects in your scene. For those using plines to generate contour or other lines with a high vertex count; did you know there is an express tool that will reduce the number of segments/vertexes for you? Check out the Express Tool "Overkill", available from the pulldown menu Express>>Modify>>Delete duplicate objects, from the command line by typing "Overkill" or from the command line only by typing "-Overkill". If you work with Viz/Max chances are you are familiar with the name Alexander Bicalho. For those who are not he is not only talented but also extremely helpful to the visualization industry by providing great solutions and also helping to make Viz/Max better with each release by working for Autodesk/Discreet. Well Alex has now also joined the blogging world. Welcome to my Blog. This is just a tentative thing, and we'll see how it works out. I may come here once in a while to add new things to it, we'll see how it goes. Meanwhile, enjoy! Wishing you a great blog welcome and looking forward to reading more from you Alex. Good recap on AU 2004 and tips you should read for AU 2005 by Robin.